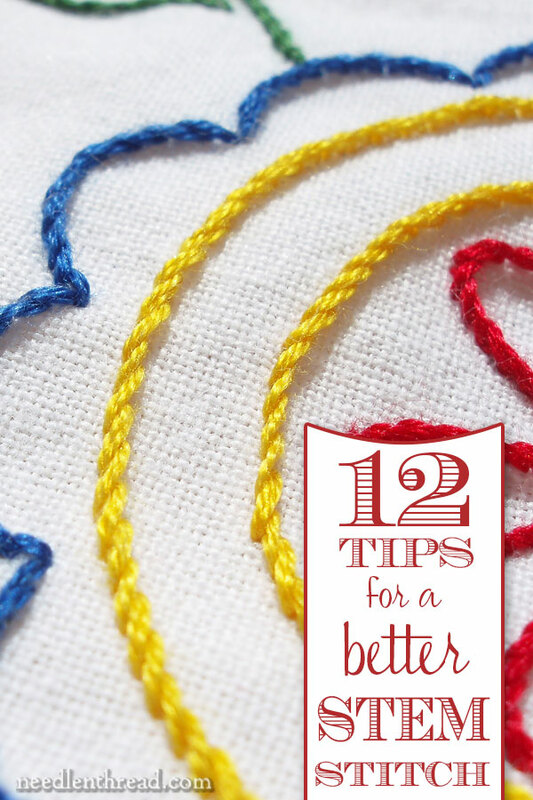 12 Tips for a Better Stem Stitch! How to do the stem stitch is not really the question we’re going to address here today – although it’s part of the question. How can I make my stem stitch look better? Since the stem stitch is so universally used in hand embroidery, and since it’s a beautiful, easy, versatile stitch worth learning well, let’s chat it up a bit with this list of 12 articles that will help you stitch a better stem stitch. First, you need to know how to work the stem stitch correctly. The easiest way to learn? Check out the stem stitch video here on Needle ‘n Thread. In the video, I work the stitch in four directions. This is important, because when you change direction with the stem stitch, the orientation of the needle and the working thread changes. If you don’t adjust the relationship between the needle and thread, you’ll end up without a stem stitch. Did you know that the type of thread you use can affect the look of your stem stitch? Did you know that stem stitch and outline stitch are very similarly worked, but they produce a completely different look to the stitch? Have you ever worked the stem stitch and wondered why it didn’t look like stem stitch? First, watch the outline stitch video here on Needle ‘n Thread (it’s newly updated), and compare it to the stem stitch video. You’ll see that the two stitches, though similar, are not the same, and they result in a completely different look. Then, read this article on s-twisted and z-twisted threads, followed by this article on Z-twisted vs. S-twisted embroidery threads, where you can see stitched samples of both types of thread. Finally, take a look at this article, which discusses the difference between stem stitch and outline stitch, and the difficulties (especially for a left-handed stitcher) in keeping the two straight. Those articles all together will help you notice the difference between stem and outline stitch and clarify the differences for you. Working a curl or a spiral in stem stitch can be tricky, if you’re unsure of where the needle should go in relation to the thread. This article on working curls & spirals with stem stitch will help explain how to keep a nice stem stitch line going through a tight curl, spiral, or circle. When you stem stitch a complete circle, it can be tricky to create an invisible join where the beginning and end of the circle meet. This article on working circles in stem stitch will show you just how to do that. Do you have trouble making a perfectly squared corner with stem stitch? Or embroidering scallops that come to a perfect point? This article will demonstrate how to handle a corner with stem stitch. This article on embroidering letters with stem stitch will help you learn how to follow the design lines on any design, whether simple or complicated. Stem stitch makes a great filling! Here are some articles that will help you work a stem stitch filling that looks great. Both articles are from the Secret Garden project, where the vines are embroidered with stem stitch filling. Not only can you fill a space with stem stitch, but you can shade with stem stitch, too! Shading with stem stitch is a lot easier to learn than shading with long & short stitch, and it can be just as effective. This article on color control in embroidery was written while I was teaching a high school needle arts class years ago. If you scroll towards the end of the article, you’ll find information on subtly shading leaves with stem stitch filling. This article on shading stem stitch vines on the Secret Garden project goes into a little more detail on blending colors and shades in the needle to produce a gradually shaded area. Any stem stitch tips to share with other stitchers, especially newbies? Chime in below! Stem stitch is one of my favorite stitches. Mostly use it for outlining a design but I’ve also used it to fill in different features on embroidery projects as well. I think I do mine slightly different (at least from all the tutorials/books I’ve read that show it). Instead of coming up directly in the middle between points A and B to make point C, I come up real close to point A to make my point C, then the usual down past point B to make D, then come up close to point B to make E. (not sure if that makes sense to anyone else besides me lol). I like the way it gives it a tighter look to the stem line. What a wonderful article! It’s quite helpful to know especially for beginners and experienced embroiders alike on the versatility of such a simple stitch. Sometimes I think we take for granted how useful something like this can be. When worked in different colors and with different types of thread its a nice reminder that the sky really is the limit when it comes to embroidery. Thanks again for reminding me and keep up the good work. Great tips Mary – thanx for the article Just one thought to share — if you are using z-twist floss, such as the floss used in Brazilian Embroidery, you need to keep the thread above the stitch rather than below. If you keep it below you will have the smoother ‘Outline’ stitch instead. Hi, Pat – thanks for reiterating that. I’ve covered it as well in the article above, with links to my previous articles on the subject, with close-ups of the two types of threads, plus an article that shows the two types of threads, stitched. This is the first time anyone has ever explained the difference between stem stitch and outline stitch. As a lefty, I sometimes think my lines can look a little disjointed and now I know why. It makes much sense, but for those who are new to stitching don’t let these differences confuse you or scare you. Your goal is to make smooth consistent stitches, regardless of which one you end up making. Most of the designs we make we can use either stitch and the embroidery will turn out just fine. Just remember to always use the same motion and direction as you stitch. It is nice, however, to understand which is which and to make these choices when you want to, even if many sets of directions may not distinguish between the two. Since I’m a beginner, when I work the stem stitch, I turn my hoop and keeping the stitch direction the same. Mrs. Corbet, you are a wonder. I love the versatility of stem stitch, but my stem stitch is most often a disgrace to embroidery! (unless I’m doing a stem stitch filling) Just recently I’ve been able to improve it some. All these articles you’ve given us links to will be such a big help to me! I read them all, and will probably come back to this post in the future for reference. I do have one question, though: What kind of thread are you using in your stem stitch video tutorial? Thank you SO MUCH! Perhaps now my stem stitch will suffer no more! I am eternally grateful. I’m with Nancy Evans about simply turning the hoop. As for S and Z twist, as a spinner and knitter, I knew the warmest mittens are twined using Z-twist wool yarn, a real labor of love! Now I have to take another look at the sampler I signed so proudly age 10 in 1952! I don’t remember having any problems with stem stitch! Thanks, Mary, for elucidating the fine points! This is a very useful reference article, Mary. I’m a leftie and I usually turn my work so I am stitching more-or-less upwards or downwards rather than left to right rather than reversing stitch directions because of thread twist. The old rule I knew for neat stem stitch outlines was “anti-clockwise around the shape, with the thread to the outside”. I discovered that sometimes that didn’t work, and I needed to go clockwise. Of course, this was when I started experimenting with non-standard threads… Now that I’ve followed up some of these links, I can see the logic clearly, and I’ll know what to do. Thanks very much for this. Thanks, Mary! This came as water to a parched throat. Such a graceful stitch. I hope you’ll find the patience to unpick the mysteries of daisy stitch too, which I love and cannot stand. I even tried it following yr. video, but I had to hide my needle in shame. Excellent links and comprehensive explanation. Many thanks.